Because of its high fat content and therefore short shelf life, since long ago mackerel was often eaten vinegared and salted, but recently it’s become common to find mackerel as a raw topping. 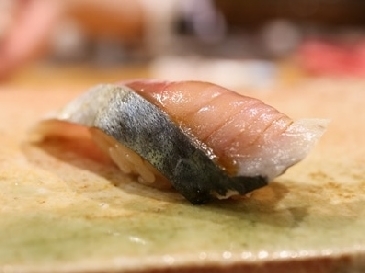 Fatty mackerel sushi is a nice treat during cold winter. The rich flavor of blue-skinned fish gives leaves you with a fine aftertaste. Trivia : Mackerel contains an ingredient called histidine. As the mackerel decays, its histidine is converted to histamine. Histamine is a toxin and it can cause urticaria, difficulty breathing from anaphylactic shock and other problems, so caution should be taken. This is why the osmotic pressure of salt is used, and the component can be removed in around two hours. 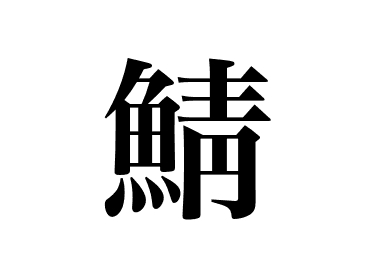 This is called “shiojime”.